See more objects with the color bisque darkgrey darkgrey grey darkslategrey or see all the colors for this object. This is a Book cover. 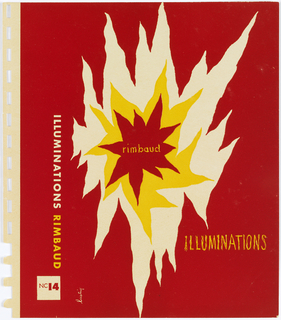 It was graphic design by Alvin Lustig. It is dated 1951 and we acquired it in 2001. Its medium is lithograph on thin glossy paper. It is a part of the Drawings, Prints, and Graphic Design department. offset lithograph on cream shiny wove paper. Signature printed, lower right center: lusitg. Printed in black ink, front cover upper center: Muriel Rukeyser: Selected Poems. 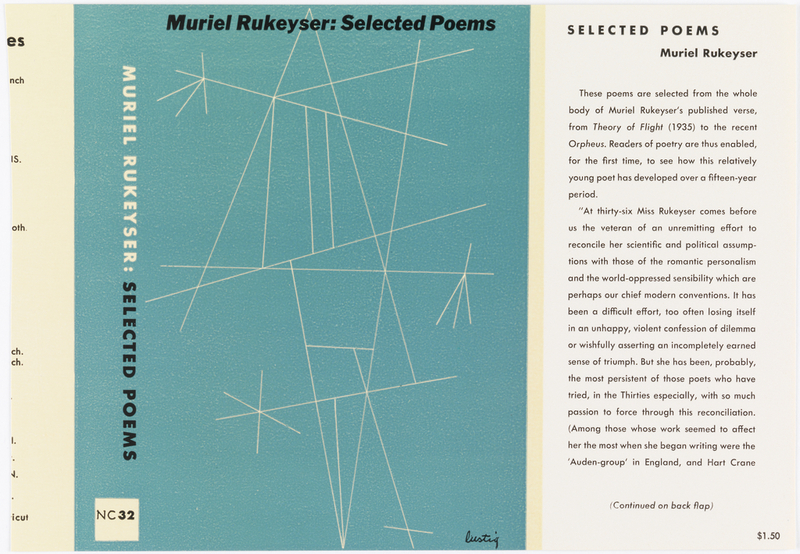 Printed vertically in white ink, side cover: MURIEL RUKEYSER. Printed vertically in black ink, side cover: SELECTED POEMS; printed horizontally in black ink, side cover: NC 32. Printed in black ink, inside flap of front cover: SELECTED POEMS/Muriel Rukeyser/These poems are selected from the whole/body of Muriel Rukeyser's published verse, from the Theory of Flight (1935) to the recent/Orpheus. Readers of poetry are thus enabled/for the first time, to see how this relatively/young poet has developed over a fifteen-year/period./"At thirty-six Miss Rukeyser comes before/us the vetran of an unremitting effort to/reconcile her scientific and political assump-/tions with those of the romantic personalism/and the world-oppressed sensibility/which are/perhaps our chief modern conventions. It has/been a difficult effort, too often losing itself/in an unhappy, violent confession of dilemma/or wishfully asserting an incompletely earned/sense of triumph. But she has been, probably,/the most persistent of those poets who have/tried, in the Thirties especially, with so much/passion to force through this reconciliation./(Among those whose work seemed to affect/her most when she began writing were the/'Auden-Group' in England and Hart Crane/(Continued on back flap)/$1.50.